Around this time every year I want to knit Christmas things: elves, ornaments, decorations, etc. 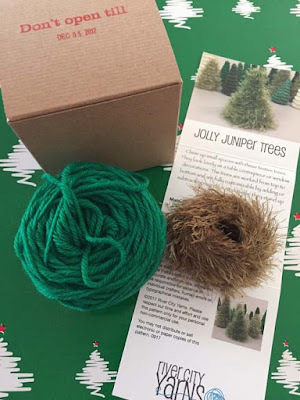 This morning's Advent Box contains a knitting project - just the kind of thing that I'm in the mood to make. If I get a chance, I may make a tree today! The green yarn is some of River City Yarns' house brand: Epic, an aran weight wool. The trees should be quite dense as the pattern calls for 3.75 mm/ US #5 needles.